Russo flew the A-36A Invader, the dive bomber version of the P-51A with the 27th Fighter-Bomber Group, 522nd Fighter-Bomber Squadron. 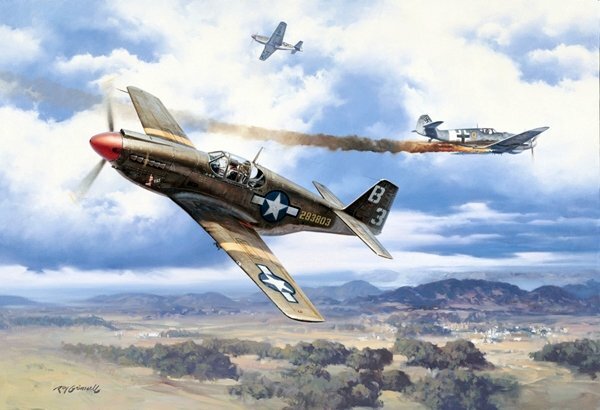 By December 30th 1943, Lt. Russo had already scored 3 victories in the skies over Italy, one of the them being a FW-190 off the coast near Salerno Italy. Now on the 30th, Russo was leading twelve A-36s on a routine bombing sortie near Rome when his formation was jumped by Messerschmitts Me-109‘s. During the ensuing air battle Russo became an Ace by destroying two Me-109s. Russo is the only A-36A pilot to become an Ace. This Lithograph depicts Russo's Fifth Victory. Hand signed by the Ace MICHAEL T. RUSSO and artist ROY GRINNELL. The overall size of this lithograph is 24" x 30"